It's 1865, and Washington is at war. Calamity causes the civilian leader of the military department to round up unusual suspects. Hooded, they're left to lie in cages, indefinitely – that is, until a commission of handpicked brass convicts them at what passes for a trial. One of them may be innocent. Getting a sense of préjà vu? No surprise there: though ostensibly about the War between the States, The Conspirator, the 2010 film this 'Grrl just saw on DVD, bears more than passing resemblance to our own era of what Washington used to call the war on terror. Secretary of War Edwin Stanton was the man in command after the April 1865 assassination of the Commander in Chief, President Abraham Lincoln. Stanton's push to dispose of accused rebels looks much like the post-9/11 push for rapid punishment of accused terrorists. Speed, and short-circuiting of the judiciary, led to convictions and executions. Yet they also fed lingering questions about the rightness of the results. In this telling by director Robert Redford, at least one accused conspirator did not deserve the hangman's noose. 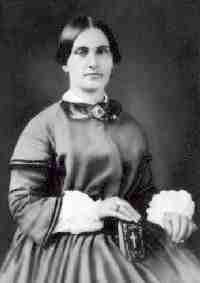 Forty-two-year-old Mary Surratt (left) may have kept too blind an eye on what was happening in her own boardinghouse. She may have given what today would be called "material support" – to her own son, who could not imagine that the Union would execute a woman, and so remained in hiding rather than exchange his fate for hers. Not long after, trial of civilians like Surratt was deemed unconstitutional, an epilogic sentence reports, in apparent reference to the U.S. Supreme Court ruling in Ex parte Milligan (1866). The Conspirator is a good film, though Redford does not always surmount the challenge of creating scenes of drama that no doubt were lacking in the actual military commission, a predetermined proceeding that unfolded in a time of far fewer procedural guarantees. Surely the film prompts viewers to think about today's military commissions, although its muted box-office reception suggests not many want now to think about such things. The film offers additional and unexpected food for thought: Stanton insists that an exemplary prosecution not only will punish the actual wrongdoers, but also will prevent further resistance on the part of the still-rebellious. His justification has echoes in rationales advanced for some of the more inclusive international criminal law theories of culpability. The folly of his prediction counsels care in such advancements.